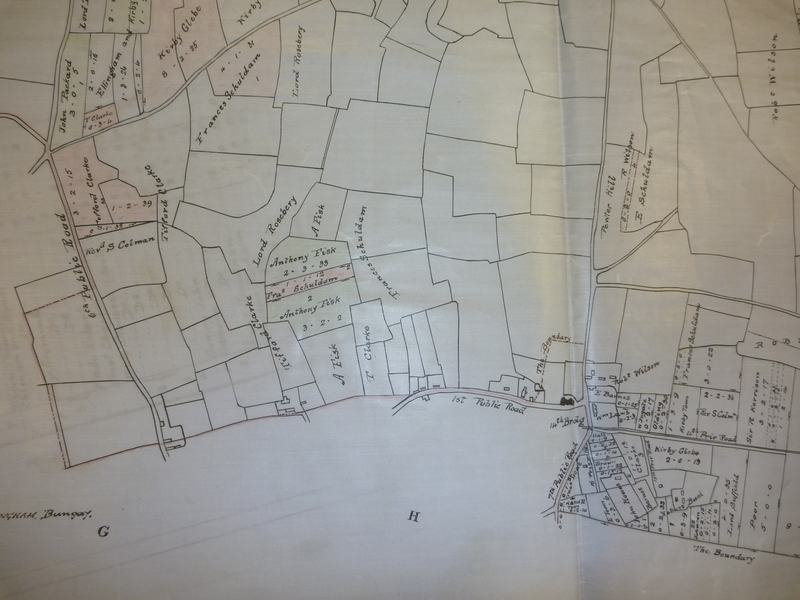 The following notes and picture come from the Norfolk Heritage websites where you can find historic notes, aerial photograph coverage and map coverage in quite good detail. Can you spot the railway station, church and river? 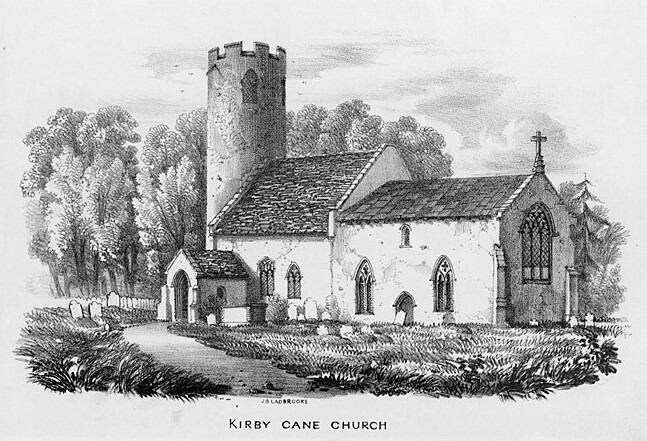 Kirby Cane is a small parish in the South Norfolk district. It is located between Stockton and Geldeston to the west and Ellingham to the east. The modern village has now grown and almost joins Ellingham. The village name has an interesting derivation. Kirby comes from Old Norse and means ‘land with a church’. The suffix Cane probably relates to the lord of the manor. This may be Walter de Cadamo who is recorded as owning land in 1205 or Maria de Cham who owned the manor in 1245. The surname Cham is French and is probably based on the town name of Caen. Land in the village is recorded in the Domesday Book when the Abbots of St Edmund held part of it. A church and mill are recorded. 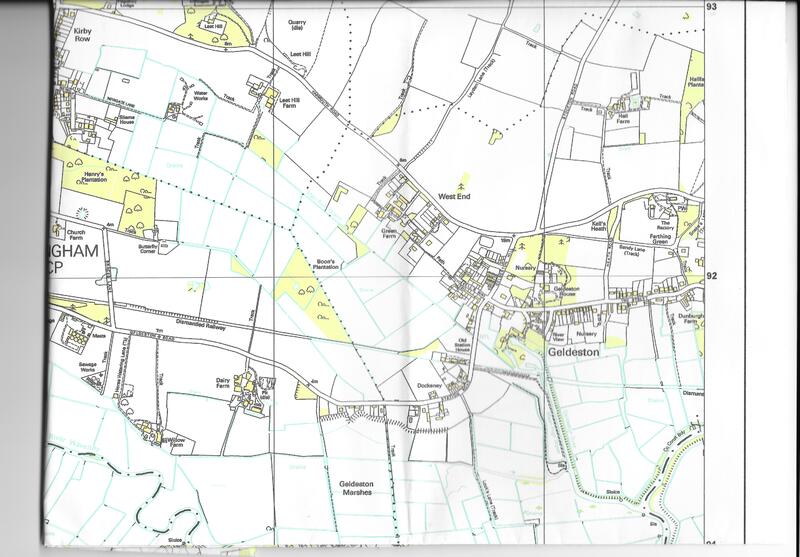 Notes concerning the management of Parish Land situated in the villages of Kirby Cane and Ellingham, Norfolk. January 2015. These notes are supplementary to evidence provided to the Parliamentary and Health Service Ombudsman on 24th June 2014. They relate to the management of Parish Lands and investments by the trustees of Kirby Cane Charity and Ellingham United Charities mentioned in that report and the failures by the Charity Commissioners to intervene. The following provides information that both Ellingham United Charity and Kirby Cane Charity de facto trustees would seem to be in Breach of Trust of their charity Governance Documents. (Appendix 1) The information herein could also be used to show that the land in question could never legally become subject to the Agricultural Holdings Act 1986 because of the prohibitions within the trust documents of the two charities. Namely, both trust documents require adherence to the Charities Act, 1993 (Appendix 2) and the Allotments Extension Act, 1882 (Appendix 3).The information can also be used when considering the introduction of fair rents on Parish Land. The Agricultural Tenancies Act of 1995 (Appendix 4) recognises the impediments of the previous Agricultural Holdings Acts and allows the opportunity for fair agreements to be made by the trustees and tenants of Parish Land. It should be noted that the EUC and KCC trust documents and the Acts of Parliament mentioned require the trustees to advertise what land is available and the rents required for that land. Openness, it seems, is required to be operated by the trustees of both sets of charities. Clause 27 Allotments Extension Act, 1882.—The Trustees shall let and otherwise manage in conformity with the provisions of the Allotments Extension Act, 1882, such of the lands belonging to the Charities as are subject to the provisions of the Fourth Section of that Act. The Trustees may set apart and let in allotments in the manner prescribed by and subject to the provisions of the said Act any portion of the land belonging to the Charities other than buildings and the appurtenances of buildings. Clause 28 Management and Letting of Property.—Subject as aforesaid, all the property of the Charities not required to be retained or occupied for the purposes thereof shall be let and otherwise managed by the Trustees. In every case public notice of the intention to let any land or other property shall be given by the Trustees in such manner as they consider most effectual for ensuring full publicity. The Trustees shall not create any tenancy in reversion after more than 3 years of any existing term, or for more than 21 years certain, or for less than the improved annual value at rack-rent, without the sanction of the Charity Commissioners or a competent Court. Power to sell, lease or otherwise dispose of all or any part of the charity’s property. (The trustees must comply with the restrictions on disposal imposed by section 36 of the Charities Act 1993, unless the sale, lease or disposal is excepted from these restrictions by section 36(9)(b) or (c) or section 36(10) of that Act.) See Appendix 2. (1)Subject to the following provisions of this section and section 40 below, no land held by or in trust for a charity shall be sold, leased or otherwise disposed of without an order of the court or of the Commissioners. (b)the requirements of subsection (3) or (5) below have been complied with in relation to it. (c) decide that they are satisfied, having considered the surveyor’s report, that the terms on which the disposition is proposed to be made are the best that can reasonably be obtained for the charity. and any report prepared for the purposes of that subsection shall contain such information, and deal with such matters, as may be prescribed by regulations so made. (b)decide that they are satisfied, having considered that person’s advice, that the terms on which the disposition is proposed to be made are the best that can reasonably be obtained for the charity. (ii)taken into consideration any representations made to them within that time about the proposed disposition. (b)the disposition is the granting of a lease for a term ending not more than two years after it is granted (other than one granted wholly or partly in consideration of a fine). if, on an application made to them in writing by or on behalf of the charity or charities in question, the Commissioners are satisfied that it would be in the interests of the charity or charities for them to give the direction. (ii)is intended to enable the demised premises to be occupied for the purposes, or any particular purposes, of the charity. (c)to any disposition of an advowson. (11)In this section “land” means land in England or Wales. (iii)if it is not an exempt charity and the disposition is not one falling within any of those paragraphs, that the land is land to which the restrictions on disposition imposed by that section apply. (b)(where subsection (2) of that section applies) that the charity trustees have power under the trusts of the charity to effect the disposition, and that they have complied with the provisions of that section so far as applicable to it. (3)Where subsection (2) above has been complied with in relation to any disposition of land, then in favour of a person who (whether under the disposition or afterwards) acquires an interest in the land for money or money’s worth, it shall be conclusively presumed that the facts were as stated in the certificate. (ii)the charity trustees have power under the trusts of the charity to effect the disposition and have complied with the provisions of that section so far as applicable to it. (iii)if it is not an exempt charity, that the restrictions on disposition imposed by section 36 above will apply to the land (subject to subsection (9) of that section). the statement which, by virtue of subsection (1) or (5) above, is to be contained in the instrument shall be in such form as may be prescribed. the registrar shall enter in the register, in respect of the land, a restriction in such form as may be prescribed. the charity trustees shall apply to the registrar for the restriction to be withdrawn; and on receiving any application duly made under this subsection the registrar shall withdraw the restriction. the charity trustees shall apply to the registrar for such a restriction as is mentioned in subsection (8) above to be entered in the register in respect of the land; and on receiving any application duly made under this subsection the registrar shall enter such a restriction in the register in respect of the land. In this Act ” trustees” shall mean trustees, feoffees, and managers, whether Corporate or sole, or a committee of the same in such cases as are provided for in the Poor Allotments Management Act, 1873. This Act may be cited as the Allotments Extension Act, 1882. (a)If application is made within the time aforesaid for part only of the field or portion so set apart, the remainder thereof may be let as provided by this Act in the case of unlet allotments ; and. (d)Where the said lands are at any time held on lease, the trustees shall proceed to act in pursuance of this Act upon the expiration of such lease, and this Act shall apply as if such expiration were the passing of this Act. This came in the form of the Agricultural Tenancies Act 1995, (IHTM24240) which is the most radical reform of land tenure legislation since 1948. It introduced a new type of tenancy structure – the farm business tenancy (IHTM24240) – which applies (with some minor exceptions) to all tenancies of farmland granted on or after 1 September 1995. The new legislation represents a substantial deregulation of new lettings, with the parties free to negotiate the terms of the tenancy without statutory interference and without the imposition of security of tenure after the expiry of the agreed term. Flounders in the Main Run Drain? I was intrigued to learn that the grandfather of an older resident of Kirby Cane had told him that when the grandfather was a boy he remembered catching baby flatfish in the dyke that runs down Newgate to the waterworks and beyond. Having researched the River Waveney somewhat, I know that there is evidence for the tidal flow to run all the way inland towards Scole near Diss. There is good present day evidence for the tidal flow at Ellingham Mill where the rise and fall is quite considerable. Further evidence for the tidal flow going well inland can be seen all around the country, a good example being the tidal bore on the River Severn. How does this relate to the Main Run Drain at Newgate? Well, if you look at the map (which can be enlarged at kirbycaneandellingham.com) you will see that the drain flows from Ellingham Island and Kirby Row to Geldeston Dyke. Various navigation acts during the 18th and 19th centuries allowed locks and sluices to be built along the R. Waveney cutting off the effect of the tides. Prior to this there was nothing to stop the tidal flow reaching up into the Main Run Drain and up to Newgate itself. That’s how I see it; are there anymore stories about the drain out there I wonder? Further chats today 14.5.15. brought up the fact that there was once a bridge for the Main Drain near to the shop. I have checked this on the Enclosure Map and sure enough there it is; 14th Bridge as marked on the map. Don’t forget to click on the map to enlarge it.